﻿B﻿esan ka ladoo is a favorite most loved festive sweet. It is prepared for Diwali celebration and it is considered auspicious to offer Besan ladoo at the Lakshmi-Ganesh pooja. Besan ke ladoo are prepared by roasting gram flour (besan) with butter or ghee and flavored with sugar and cardamom and shaped into round balls. Ladoos are one the most popular Indian sweet often prepared to celebrate festivals, religious occasion like poojas or any happy moments in the family. Ladoos are distributed as a sweet in weddings, child births and as a prasad on poojas and auspicious occasions. There are various delicious varieties of ladoos but Motichoor ka ladoo (boondi ladoo), atta, soozi ka ladoo (flour & cream of wheat), Til ka ladoo (sesame seeds), Nariyal ka ladoo (coconut) and besan ka ladoo are among the most popular ladoos. Ladoos are a special treat they can be enjoyed at any holiday as well any day you feel like eating sweet. Besan ladoo is very easy and simple to make. and mix and continue stirring for 5to 6 minutes. 4. Besan will start giving nice nutty fragrance and will start releasing ghee. 5. Remove the pan from the stove. Add sugar and crushed cardamoms and mix. 6. 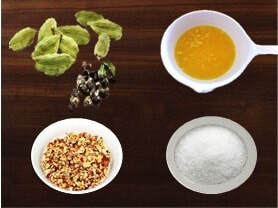 Add chopped nuts at this time and mix. 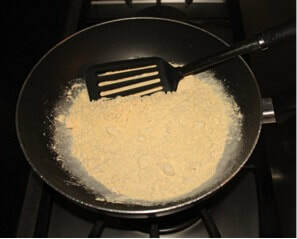 Stir well so that no lumps are formed. 7. Once you have mix the Ladoo mixture let it cool down to room temperature. 8. 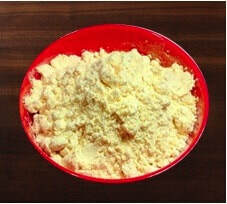 To make the ladoos, take about 2 tablespoons of basen mixture into your palm. as you prefer). Repeat the process until all the ladoos are made. ladoos can be stored in an airtight container for 2 to 3 weeks. become easier to form the ladoos. besan or use powder sugar. it will give a raw taste to the ladoos.